movement of people and goods and the worsening violence continue to affect the social and economic life of Palestinians, with consequences for their health status and access to health services. Deaths and injuries resulting from the occupation and the internal conflict increased during 2007 and continued to rise in the first months of 2008. 2. The slow but steady rise in life expectancy has nevertheless continued; figures for infant and child mortality, however, have remained virtually unchanged in recent years, despite the global commitment to achieving the health-related Millennium Development Goals (see Annex). 3. 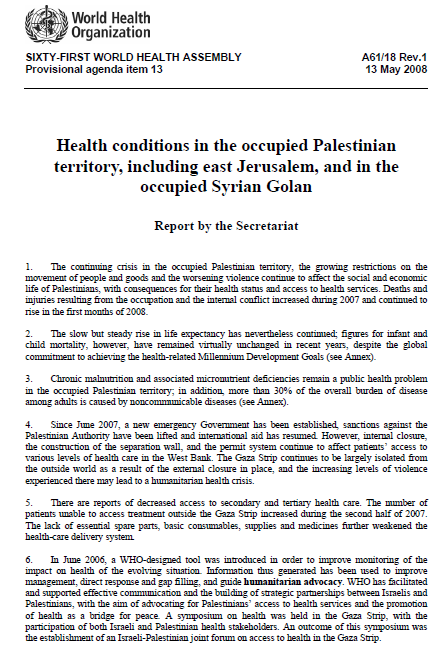 Chronic malnutrition and associated micronutrient deficiencies remain a public health problem in the occupied Palestinian territory; in addition, more than 30% of the overall burden of disease among adults is caused by noncommunicable diseases (see Annex). experienced there may lead to a humanitarian health crisis. patients unable to access treatment outside the Gaza Strip increased during the second half of 2007.
the establishment of an Israeli-Palestinian joint forum on access to health in the Gaza Strip. product fell by 8.8%. In the first quarter of 2007 the trend worsened, with a further decrease of 4.2%. the prospects for long-term growth. 3. In the first half of 2007, the Palestinian Authority’s deficit was US$100 million per month.